There is no other sweet that equals chocolate in global popularity. From the world’s leading five star restaurants to the corner grocery store, chocolate is everywhere. But such was not always the case. There was a time, not all that long ago as history goes, that chocolate was available only to the elite of ancient Mexico and laterthe nobles of imperial Spain, but only as a drink. That’s right – no candy bars, bonbons, truffles or chocolate curls. Despite chocolate’s first appearance in Europe in 1528, it would be several centuries until Francois-Louis Cailler encountered pressed chocolate at a local food fair near Turin, Italy. Knowing a good, no, great thing when he saw it, Cailler remained in Turin for four years learning everything he could about Italian chocolate techniques. Finally it was time for him to return to Switzerland and there he made culinary history. By 1819 Cailler had opened his first factory in Corsier near Vevey. He produced a velvet smooth bar of dark chocolate that the world had been waiting for. Needless to say, it became an overnight sensation. The resulting increase in sales (who could resist the silky texture?) caused the price of the individual bars to drop low enough that now anyone could savor this former ‘nobles-only’ treat. Working beside Cailler was a young man named Daniel Peter. Not only did he become Cailler’s right hand man, he also became his son-in-law. No one living in Switzerland, then or now, can miss the many grazing herds of cattle dotting the emerald green mountain slopes. And that’s a problem as well as a benefit. You see, Switzerland was producing more milk than she could consume, great though the quality was. Too fragile to export, some of the milk had been historically converted into cheese. But there was still a lot of surplus milk. Why not, Daniel reasoned, blend some of the milk into the new bars, creating a milder form of chocolate? 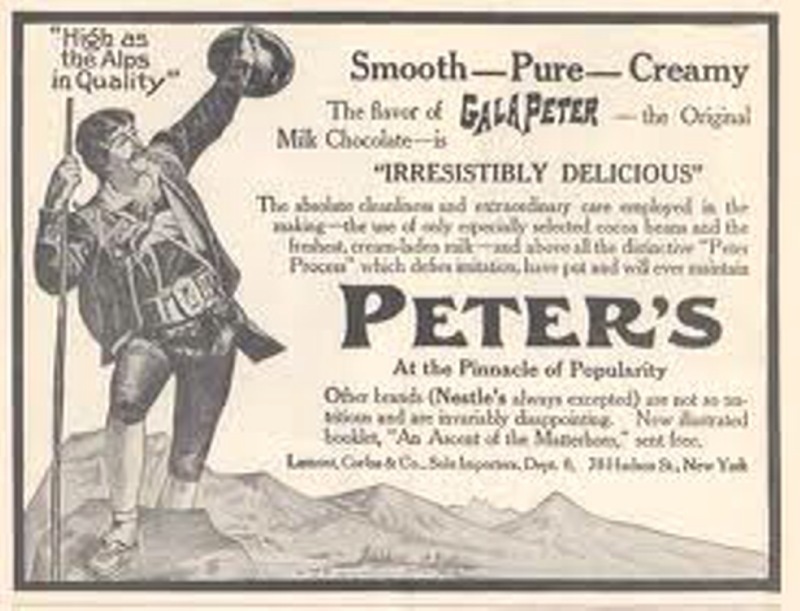 And after a great deal of experimentation, that’s just what Daniel Peter did – he invented milk chocolate by 1857. But there was a problem. When he sought to remove the water from the milk in order to blend the resulting dry powder into his new chocolate mixture, mildew would occur on the bar’s surface. Not a good thing, to say the least. Daniel asked Henri Nestle, who at this time was canning milk for children, to help him solve this problem. Nestle’s firm was already famous for its progressive insight into new food safety procedures. Even so, it took seven years of painfully slow research to develop the process, but by 1875 milk chocolate was a reality. It was such a success that in 1879 the two men formed the Nestle Chocolate Company. But least you think that all chocolate matters are solely Swiss, there is one more individual to meet – John Cadbury, the thoughtful English Quaker chocolatier. Cadbury started life as a merchant but one with a conscience. As a member of the Society of Friends, he did not want to sell alcohol because he saw the sad damage it inflected on families. But chocolate made people feel good and so he focused on that, eventually forming a company that provided chocolate to the world. And they provided it often in a heart-shaped box. That’s right, a Cadbury (Richard Cadbury, John's son, to be exact) created the design for that red ruffly box that you’re seeing everywhere right about now. Originally it was crafted as an eye-catcher and it still is with over 36 million such boxes sold annually in the U.S. alone. So “take heart” (literally) and say a thanks to Francois-Louis Cailler, Daniel Peter, Henri Nestle and John Cadbury. Without them, we’d all have to be in the jungle or be a member of the formal Spanish court, hoping we were “chocolate-worthy”. Posted on February 3, 2011 by Ana Kinkaid and tagged Daniel Peter Dark Chocolate Francois-Louis Cailler Heart Shaped Candy Boxes Henri Nestle John Cadbury Milk Chocolate Richard Cadbury.